I bought a HUGE head of cauliflower last week and after making half of it for dinner one night, I needed to figure out a different way to use up the rest of it. I was thinking of roasting it, but it’s been a little hot and humid, so I didn’t want to turn the oven on. 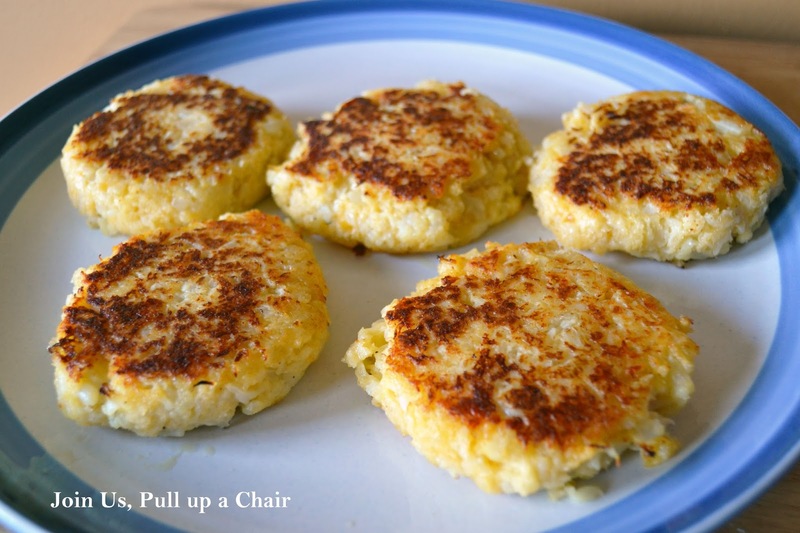 Replacing potatoes with cauliflower is a great way to change things up and I thought I could take a recipe for potato cakes and do the same with cauliflower. It worked out great and everyone loved it – including my 15 month old son who’s been quite picky these days. I’ll definitely be making these again! They’d be great for breakfast too! Steam the cauliflower until fork tender. Once steamed, place cauliflower on a plate and allow to cool. Transfer to a bowl and mash. Add in the eggs, cheese, panko and spices and stir to combine. Scoop out 1/4 cup (more or less) of the cauliflower into your hand and form a patty. Place on a plate and continue making patties until all the cauliflower is used. Place the plate in the freezer for 10 minutes to allow the patties to firm up. Heat a tablespoon of olive oil in a large skillet over medium heat. Place the patties into the pan and allow to brown on both sides. Place on a paper lined plate to remove any excess oil and serve!